The former home of Alaska Gov. Sarah Palin on Wasilla Lake in Wasilla, Alaska, is seen Wednesday, Sept. 24, 2008. Two months before Palins tenure as mayor ended in 2002, she asked city planning officials to forgive zoning violations so she could sell the house. Yet more of Alaska Governor Sarah Palin’s distortions and lies have been revealed in regards to her tenure as mayor of Wasilla, Alaska. Contrary to her self-proclaimed role as a fighter against corruption, Mayor Palin was not at all above accepting gifts and seeking favoritism, both for herself and her friends. In a report by Brett J. Blackledge for the HuffingtonPost.com published September 28, 2008, he scrutinizes the many benefits and perks of Mayor Palin’s administration. Though Sarah Palin depicts herself as a pit bull fighting good-old-boy politics, in her years as mayor she and her friends received special benefits more typical of small-town politics as usual, an Associated Press investigation shows. When Palin needed to sell her house during her last year as Wasilla mayor, she got the city to sign off on a special zoning exception _ and did so without keeping a promise to remove a potential fire hazard. She gladly accepted gifts from merchants: A free “awesome facial” she raved about in a thank-you note to a spa. The “absolutely gorgeous flowers” she received from a welding supply store. Even fresh salmon to take home. She also stepped in to help friends or neighbors with City Hall dealings. She asked the City Council to add a friend to the list of speakers at a 2002 meeting _ and then the friend got up and asked them to give his radio station advertising business. That year, records show, she tried to help a neighbor and political contributor fighting City Hall over his small lakeside development. Palin wanted the city to refund some of the man’s fees, but the city attorney told the mayor she didn’t have the authority. Palin claims she has more executive experience than her opponent and the two presidential candidates, but most of those years were spent running a city with a population of less than 7,000. Some of her first actions after being elected mayor in 1996 raised possible ethical red flags: She cast the tie-breaking vote to propose a tax exemption on aircraft when her father-in-law owned one, and backed the city’s repeal of all taxes a year later on planes, snow machines and other personal property. She also asked the council to consider looser rules for snow machine races. Palin and her husband, Todd, a champion racer, co-owned a snow machine store at the time. Palin often told the City Council of her personal involvement in such issues, but that didn’t stop her from pressing them, according to minutes of council meetings. She sometimes followed a cautious path in the face of real or potential conflicts _ for example, stepping away from the table in 1997 when the council considered a grant for the Iron Dog snow machine race in which her husband competes. But mostly, like other Wasilla elected officials at the time, she took an active role on issues that directly affected and sometimes benefited her. Her efforts to clear the way for the $327,000 sale of the Palin family home on Lake Wasilla is an example. Two months before Palin’s tenure as mayor ended in 2002, she asked city planning officials to forgive zoning violations so she could sell her house. Palin had a buyer, but he wouldn’t close the deal unless she persuaded the city to waive the violations with a code variance. The Palins, who were finishing work on a new waterfront house on Lake Lucille about two miles away, asked the city for the variance. The request was opposed by one planning official and some neighbors. “I would ask that the Wasilla Planning Commission apply the exact same rules in this situation that it would apply to other similar requests so that our community can see that being a public figure does not give anyone special benefits,” urged neighbor Clyde Boyer Jr. in a 2002 note to the city. The Palins’ house was built by the original owner too close to the shoreline and too close to adjacent properties on each side, including a carport that stretched so far over it nearly connected the two houses. The Palins didn’t create the zoning problems, but they should have known about them when they bought the house, wrote Susan Lee, a code compliance officer with the Matanuska-Susitna Borough, in response to the Palins’ request. The borough, similar to a county government, makes recommendations to the city, which has final say. Lee, in recommending the city reject the request, noted that the exception was needed to resolve an “inconvenience” the Palins experienced while trying to sell their house. In 1989, another borough planner told a previous owner that a variance for the carport couldn’t be approved because it didn’t meet required conditions and was a potential fire hazard. Krug asked Palin to let him know if he was wrong in his impression that the carport would be removed. 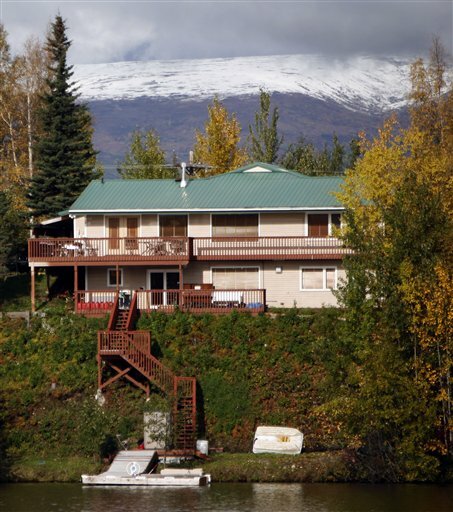 On Sept. 10, 2002, the seven-member Wasilla Planning Commission unanimously approved a variance for both sides of the property, with language covering “all existing structures.” Less than a week later, the Palins signed a deed to sell the house to Henry Nosek. The carport was never removed. Nosek said Sarah Palin didn’t do anything more than any other citizen would have done. “I sincerely don’t feel that Sarah used her position as mayor at the time to get that accomplished,” said Nosek, who no longer lives in the home. James Svara, professor of public affairs at Arizona State University and author of “The Ethics Primer for Public Administrators in Government and Nonprofit Organizations,” suggested such behavior is part of small-town politics. “Small towns are first-person politics, and if people are close, it’s hard to separate one’s own personal interest and one’s own personal property from the work of the city,” Svara said. The key questions from an ethics standpoint include whether the politician makes a potential conflict of interest known and removes himself or herself from actions related to it, he added.